Shtandart (russian for flag) is a replica of a XVIIIst century russian frigate under the reign of Peter the Great. Her building lasts 5 years from 1994 to 1999. 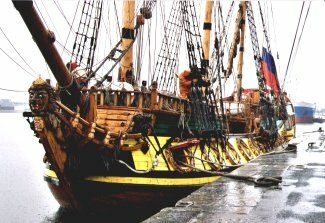 In order to wait for the thaw in her port of registry (Saint Petersbourg), Shtandart stayed five monthes in Saint Malo dock during winter 2001. She wears 660 m² sails and can embark 10 crew members and 30 trainnees.